This timely book looks at new ways for businesses to communicate over the Internet using video and audio. It includes advice on the equipment and software required, together with tips on content creation. Many large companies are already using the streaming video and audio for business communications. For example, agricultural and bio-fuels giant Archer-Daniels-Midland Web-cast its 2006 Annual General Meeting to shareholders and a few weeks later used the Internet to make a presentation to financial analysts and then company executives fielded questions from the analysts which they asked over a toll-free phone connection. Both of these events were broadcast in real time and then made available for viewing for several weeks afterwards on the company Web site. Other companies are using Web casting to introduce new products or software. The technology to do all this is relatively inexpensive and it permits businesses to communicate to the entire world; rather than just a few people sitting in a room watching a presentation. It permits small and medium-sized businesses to reach far larger audiences, with much better content and much more quickly than was ever possible in the past. This book will show you how to create and broadcast your own streaming video and audio. INTRODUCTION - What do we Mean by Streaming Video and Audio? CHAPTER 1 - Why this New Technology is so Important? CHAPTER 9 - Do-it-yourself or Outsource? CHAPTER 19 - Where Next? 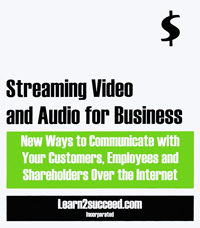 Streaming Video and Audio for Business: New Ways to Communicate with Your Customers, Employees and Shareholders Over the Internet by: Learn2succeed.com Incorporated: softcover; 140 pages; ISBN: 978-1-55270-302-1; published in 2008; $24.95.